China-based smartphone maker Vivo is the pioneer in embedding a fingerprint sensor under the display of a consumer-ready smartphone. Now Vivo has unveiled a new concept phone at Mobile World Congress in Barcelona which could turn out to be the future of smartphones. Vivo’s concept phone is called Apex and it’s unlike any device we have seen till date. It has some very interesting features pop up camera, sound casting and fingerprint sensors embedded in a nearly bezel-free screen which would blow your mind. In this post, I’ll walk you through all the information we received regarding Vivo APEX. The APEX has a 5.99 inch OLED display with COF technology. This smartphone is supposed to have the thinnest bezels yet on any smartphone. The company actually claims to hold a record of a screen-to-body ratio of 98%. The thickest bezel on the phone is its chin, and that is about 4.3mm thin and the side bezels measure about 1.8mm which is insane. Vivo has confirmed that the APEX will sport the fastest processor, the Snapdragon 845 chipset. This is a great step taken by Vivo as the previous X20 plus UD did not have a lot of specifications to accommodate the Clear ID technology. As the X20 Plus, the Apex is also going to have the best fingerprint sensor, but the Apex is going to take it a little further. 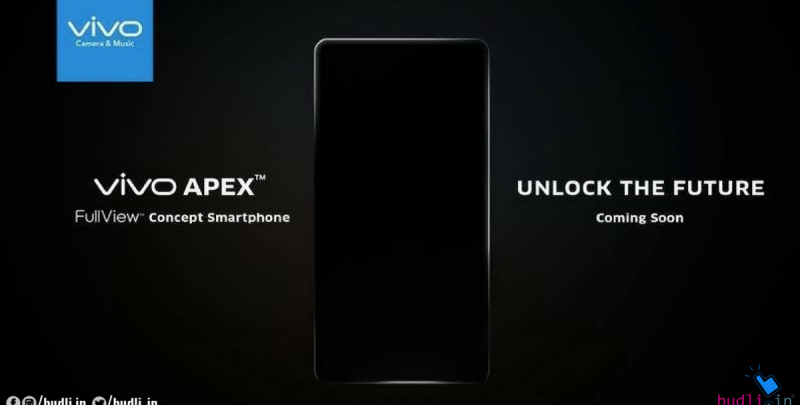 Apex has a fingerprint sensor which covers half of the display screen. This gives the user a lot of place to unlock the device, unlike the other smartphones. The company has placed the ambient and proximity sensors under the display. This makes sure that the whole screen works as an earpiece, similar to the Xiaomi Mi MIX from 2016. Vivo reveals that the new Sound Casting Technology essentially transports the sound across the glass of the display. The most awaited feature in the Apex is its front camera which is supposed to pop out when needed. It only takes 0.8 seconds to completely come out of the device and it is an 8 MP camera with HDR and a dynamic range of up to 14 EV. It will be fascinating to see such a device in the market which completely eliminates the bezels and has moving parts in it. For all those who want to get rid of their existing smartphone and upgrade to a new one, I have an amazing idea to save you a few bucks. You just have to log on to budli.in which is the largest e-commerce site for refurbished electronic gadgets. Budli is great as it offers great discounts for your device’s upgrade. Not only smartphones but there are a lot of other electronic gadget options to choose from budli.in. Get your next device from budli.in.